Honeydew melons are large, oval-shaped melons with a smooth rind that range in color from white to pale green. The flesh is usually a pale green, although some varietals have a slightly gold flesh. Honeydew melons are comprised of about 95 percent water and, as such, contain fewer carbohydrates than other melon varieties. But, as with most foods, it is important to maintain portion control given that honeydew contains a significant amount of sugar. Honeydew is available fresh almost all year, with peak season running from June to October. Honeydew is an exceptional source of vitamin C and potassium. It also provides soluble and insoluble dietary fiber needed to maintain digestive health. With its high water content, honeydew melon is the ideal food to eat immediately after a workout. It is also rich in electrolytes, such as potassium, calcium, sodium, and calcium, which your body needs to properly hydrate after strenuous physical activity. Honeydew melon is relatively low in carbs but is generally not included in the early phases of either the Atkins Diet or South Beach Diet. In the induction phase of the Atkins diet, for example, you are encouraged to consume no more than 12 to 15 grams of carbs per day. (Honeydew has 16.1 grams per serving). Similarly, the South Beach diet bans all fruits for phase 1 of the diet plan. Outside of these early phase strategies, honeydew fits well within the parameters of most low-carb or ketogenic diets. Honeydew offers a healthy dose of soluble and insoluble fiber, types of indigestible carbs that help keep you regular and helps regulate the absorption of fats, sugars, vitamins, and minerals. Roughly 90 percent of the carbohydrates in honeydew comes from simple carbs, namely sugar. Of the 14.4 grams of sugar in a serving of honeydew, more than third is from fructose. The rest is comprised of glucose and sucrose. Because sugar is a type of carbohydrate, you need to count it as a part of your daily intake. Between 45 percent and 65 percent of your daily calories should be derived from carbs, according to the 2015-2020 Dietary Guidelines for Americans. For an average 2,000-calorie diet, that would translate to a daily carb intake of between 225 to 325 grams. Honeydew is truly cholesterol-free and is virtually fat-free as well. If you have high cholesterol, eating honeydew can be an ideal way to trim your daily fat intake, as it fills you up relatively quickly and quells your appetite with its honey-like sweetness. Honeydew melon doesn't offer much in the way of dietary protein. If you need to boost your protein intake, wrap a spear of honeydew in a half slice of prosciutto or speck for an additional 8.5 grams. Honeydew is also rich in antioxidants, such as beta-carotene, caffeic acid, phytoene, and quercetin, that the body needs to prevent oxidative damage to cells. Beyond nutritional benefits, honeydew may be useful in managing or preventing certain health conditions. As an excellent source of vitamin C, it helps boost immune function and may reduce the risk of the common cold and certain upper respiratory infections. According to research published in the journal Nutrients, a daily intake of 100 to 200 milligrams of vitamin C is considered protective against common respiratory and systemic infections in healthy adults. One serving of honeydew offers roughly 26 milligrams. The combination of low sodium and high potassium is considered beneficial to controlling your blood pressure if you have hypertension. Honeydew melon offers both of these things. People with hypertension are typically advised to consume no more than 1,500 milligrams of sodium per day from all sources, including salt. For its part, the recommended potassium intake for an average adult is 4,700 milligrams per day. Honeydew melon offers just 32 grams of sodium while delivering an impressive 300 milligrams of potassium per serving. As such, honeydew can be included part of a dietary intervention to reduce your blood pressure. It may also prevent the progression of prehypertension (in which the blood pressure is elevated but does not yet require drug treatment). Potassium also maintains fluid and electrolyte balance and is required for proper nerve conduction and muscle contraction. While the sugar in honeydew may suggest that it can adversely affect blood sugar, it may actually have a beneficial effect. This is due to soluble fiber in honeydew, which binds to sugar molecules and slows the rate of absorption. It is for this reason that honeydew melon falls into a glycemic index (GI) of 65 despite the increased sugar content. There is also evidence that honeydew melon and fresh fruit can reduce the risk of type 2 diabetes. A 2017 study from China, analyzing the medical records of 482,591 adults from 2004 to 2008, concluded that high daily fruit consumption was associated with a 22 percent reduction in diabetes risk as well as a 27 percent reduction in the all-cause mortality risk. By contrast, there is little evidence that honeydew can reverse blood sugar levels in people with diabetes. As such, if you have diabetes or are looking to modify your carb intake, it is best to keep your portion to one serving. If you want to prevent blood sugar spikes, pair honeydew melon with a protein, such as nuts, low-fat Greek yogurt, or low-fat cottage cheese. Folate is an essential micronutrient that the body needs to break down homocysteine (an amino acid mainly derived from meat). High levels of homocysteine in the blood confer to an increased risk of heart disease, kidney disease, and bone mineral loss. Vitamin B6 (pyridoxine) offer similar protection against excessive homocysteine (homocysteinemia). The good news is that high homocysteine levels can often be normalized with diet. Although honeydew melon has been under-researched in this regard, 2012 study from the University Of Southern California concluded that a high intake of nutrient-dense fruits and fiber can increase your "good" high-density lipoprotein (HDL) cholesterol by 28 percent after just two weeks, corresponding to a steep reduction in cardiovascular disease risk. Honeydew melon can also help prevent folate deficiency during pregancy, the condition of which can increase the risk of neural tube defects. The high vitamin C content in honeydew can support the production of collagen, a major structural protein that the body needs to maintain and repair skin tissue. The antioxidative effects of vitamin C may also reduce skin damage caused by sun exposure, according to 2017 research from the University of Otago in New Zealand. In terms of bone health, the folate in honeydew can combat the adverse effects of homocysteine on bone mineralization. High homocysteine levels are linked to a loss in bone mineral density (BMD), which can lead to osteoporosis, particularly in postmenopausal women. Increased folate intake, along with increases in vitamin K (vital to the production of a structural protein in bone), can potentially slow or even reverse bone loss. Does honeydew differ from cantaloupe nutritionally? The biggest difference between honeydew and cantaloupe is the content of vitamin A and Vitamin C. Cantaloupe offers 373 percent of the RDI of vitamin A, where honeydew contains a mere two percent. Similarly, cantaloupe delivers 337 percent of the RDI for vitamin C compared to 53 percent with honeydew. As for calories and carb, honeydew and cantaloupe match up almost identically (although honeydew has slightly more carbs due to the fructose content). 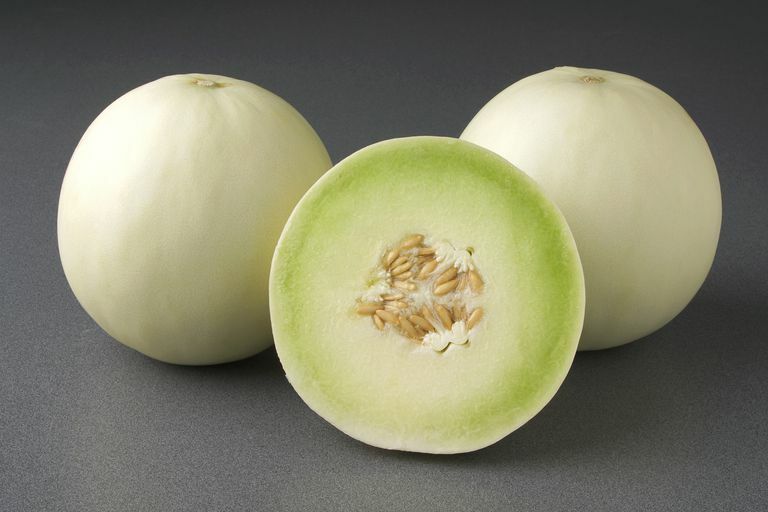 Both honeydew and cantaloupe are varietals of Cucumis melo, also known as muskmelon. How can you tell if a honeydew melon is ripe? Choose melons that are heavy for their size and have smooth, undamaged skin with a slightly waxy feel. Avoid melons that are overly soft or feel damp at the stem end. A ripe honeydew should give off a noticeably sweet, almost honey-like aroma. It should yield slightly when you press the blossom end (opposite of the stem end). If your melon is not yet ripe, store it at room temperature. Refrigerate it as soon as it ripens to prevent it from turning mushy. After the melon is cut, store it in the refrigerator in an airtight container for no more than three or four days. Because melons have such a high percentage of water, cooking them destroys their firm texture. As such, honeydew is best served raw, either diced or sliced. It can be tossed in a fruit salad, blended into smoothies, or paired with a protein such as low-fat Greek yogurt, cottage cheese, or ricotta. A true allergy to honeydew melon is uncommon. However, cross-reactive symptoms may occur when eating melon due to a phenomenon known as oral allergy syndrome (OAS). This is when the body mistakes melon for certain tree or grass pollens that cause "true" allergies. The two pollens most commonly associated with honeydew OAS are grass pollen (from May to early-July) and ragweed (from mid-August to mid-September). Symptoms will usually develop right after eating the fruit and may take an hour to resolve. An over-the-counter oral antihistamine may help relieve the symptoms. Call your doctor or seek urgent care if the symptoms persist or worsen. There are no known drug interactions to honeydew melon. Carr, A, and Maggin, S. Vitamin C and Immune Function. Nutrients. 2017 Nov 3;9(11). DOI: 10.3390/nu9111211. Du, H.; Li, L.; Bennett, D. et al. Fresh fruit consumption in relation to incident diabetes and diabetic vascular complications: A 7-y prospective study of 0.5 million Chinese adults. PLoS Med. 2017 Apr;14(4):e1002279. DOI: 10.1371/journal.pmed.1002279. Mietus-Snyder, M.; Shigenaga, M.; Suh, J. et al. A nutrient-dense, high-fiber, fruit-based supplement bar increases HDL cholesterol, particularly large HDL, lowers homocysteine, and raises glutathione in a 2-wk trial. FASEB J. 2012;26(8). DOI: 10.1096/fj.11-201558. Pullar, J.; Carr, A.; Visses, M. et al. The Roles of Vitamin C in Skin Health. Nutrients. 2017 Aug; 9(8):866. DOI: 10.3390/nu9080866.